Books about books are obvious must reads. In hindsight, this one got picked up by all kinds of traditional outlets for regular media hype! A sweeping and captivating debut novel about a young librarian who is sent a mysterious old book, inscribed with his grandmother's name. What is the book's connection to his family? One day, Simon receives a mysterious book from an antiquarian bookseller; it has been sent to him because it is inscribed with the name Verona Bonn, Simon's grandmother. Simon must unlock the mysteries of the book, and decode his family history, before fate deals its next deadly hand. I read about half of The Book of Speculation last June when it first came out. It was a slow build. The book opens with an intriguing mystery about a book, a travelling circus featuring a mermaid, a wild man and fortune teller, and a modern-day family embedded in the modern circus/carnival movement. The story goes back and forth, chapters alternating between the story set in the present, and the story set in the 18th century. And while the set-up hooked me... well, by about half-way, I gave up. The pacing is very slow, and I started to lose interest. Eventually, I set the book aside, intending to come back to it. Now that I'm trying to clean up my Netgalley ARCs, I picked the book up again. Good news? I was able to start reading exactly where I left off and wasn't confused in the least. The bad news? That told me that the story was really labored and repetitive. I didn't feel like I'd forgotten anything because either not much had happened, or all the important details are emphasized repeatedly. Things did pick up a *little* toward the end of the book, but nothing felt unexpected. Perhaps a couple details were a little surprising, but I didn't really feel like they had a huge impact on the story. It was a bit disappointing, to be honest. The book is promoted as literary fiction with magical realism, and while I won't deny there is some lovely writing in this book...it's so slow, guys. Maybe I've been spoiled by all the genre reading I've done lately? While I didn't dislike the main characters, I wouldn't say I really liked them either. Main character Simon is locked in researcher mode, and seems a bit emotionally paralyzed as he tries to cope with everything. The historical characters felt a step removed, as did Simon's angry sister, Enola. I never really aligned myself with anyone, so it was difficult to care too much about what happened to them. The Book of Speculation has some great ideas in it, and some elements for fantastic storytelling. The carnival, tarot-cards, and mysterious book are all great hooks. But the book flounders through the middle, and by the end, I just didn't care anymore. 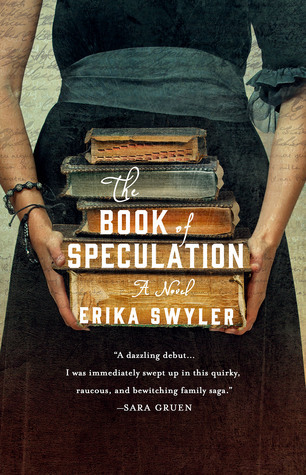 I haven't read either of the two books The Book of Speculation was compared to (The Night Circus and Like Water for Elephants), but I suspect many people will have better luck with those. I really wanted to like this one--books about books, historical settings and creepy, magical realism are all things I adore. But unfortunately, it didn't come together into a compelling story.